Refer to your monthly bill statement. Your due date falls on the same date every month. Please click here to locate your district and find your available payment options. My water bill appears higher than normal – what should I do? Your water meter can be a very useful tool in determining whether you have a water leak. Your meter is usually located in a black rectangular meter box located in the easement close to the street or sidewalk. When opening the lid to the meter box, be cautious as sometimes it has become home to insects, spiders, frogs, and yes, even a snake. Once you have the meter box opened, it may be necessary to wipe off the face of the meter in order to see it clearly. 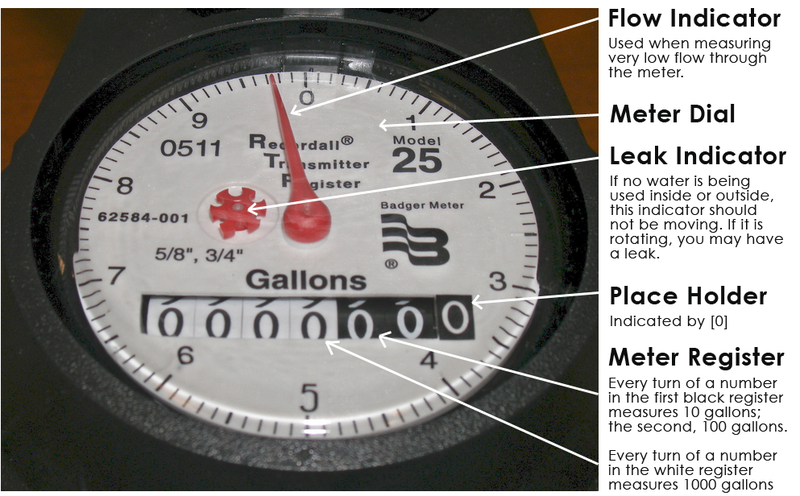 Your meter is equipped with a “low flow detector” that rotates in a clockwise direction when water is being used. The meter is designed to detect even the smallest amount of usage frequently associated with small leaks. To check for leaks, turn off all faucets and equipment that use water. Watch the “low flow detector” very closely. If there is any movement in the “low flow detector” and you are sure everything that uses water has been turned off, that is an indication that there is a leak. The speed at which the “low flow detector” moves indicates how large the leak is. I have a leak, now what? Now that you have found that there is a leak, the next step is finding the source of the leak and stopping it. Continuous leaks as small as 1/16th of an inch can cause water waste as much as 24,667 gallons in a month. A dripping faucet can waste 3 gallons a day or 1095 gallons a year. Finding and repairing a leak saves water and money. Who should I call for water leaks? My water is discolored – what should I do? For five to fifteen minutes run the tap closest to the outside pipe which brings incoming water from the meter. This should clear any particles out of the line. If the discoloration does not disappear, call Customer Service at 832-467-1599. What should I do if I have a sewer back-up? Please contact our Customer Service Department immediately at 832-467-1599. Please contact our Customer Service Department at 832-467-1599 for assistance. The lack of water at the property may be a result of an outage in the area or disconnection for non-payment. Please contact our Customer Service Department at 832-467-1599 for further account investigation. Can you help me understand my first bill? On your first utility bill, you can expect to see usage charges from the date of activation to the last meter reading date. If you want more information on your rates, please go to “your district” to review your welcome packet for all rate information. How do I cancel or transfer service? Call EDP at 832-467-1599. Please readily have your cutoff date as well as your forwarding address for your final bill. Your account will be closed effective the date requested, and a final bill will be generated and mailed to your new address. You can also send us this information via our “contact” page. If I move and cancel service, do I get my deposit back? The deposit will be applied toward your account after the due date of the final bill. Once all credits, adjustments, and payments have posted to your account, you will automatically be sent a refund check should any credit remain on your account. The refund will be sent approximately 30-45 days from cancellation via the US Postal Service. Can another person take over or be added to my account? If you no longer wish to be financially responsible for your utility service, please contact Customer Service at 832-467-1599 and we will close your account. To add a person to your existing account, please fax a letter with your request along with the ID of the person being added to 832-467-1610 or email Customer Service at customerservice@edpwater.com. Please note: Once a person has been added to your account neither person can be removed. How do I reconnect service? If your service has been disconnected, please contact Customer Service at 832-467-1599 prior to making any electronic payments to inquire what is needed to reconnect services. If I install a pool, what will the water costs be? Monthly water costs for building and maintaining a pool vary depending upon the size, pumps, maintenance plan and evaporation rate. A typical pool takes about 20,000 gallons of water to fill. Your District does not offer a discount for filling pools. For more specific details on your pool, please contact your pool builder or contractor. How will I know the water hardness, fluoride content, or other water characteristics in my area? Please refer to Our District’s for the most current Consumer Confidence Report (CCR)/Water Quality Report. EDP is required by the state to test for certain water characteristics. If you have any additional questions, please call Customer Service at 832-467-1599. After I pay for a new water meter, how long do I have to wait for the installation? Typically the meter is installed within 10 days after EDP has received the signed Service Agreement and payment for the meter. However, weather conditions or other uncontrollable events may delay installation. If I have a broken or missing meter lid or meter box – how can I get it replaced? Please contact our Customer Service department at 832-467-1599 or through our “contact” page and we’ll schedule a service technician to replace the lid or meter box.